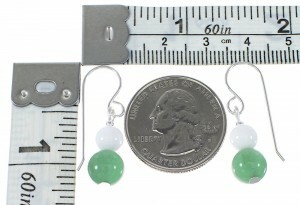 Sterling silver, real Aventurine, and White Agate. We bring to you this adorable pair of earrings! This piece of Native American jewelry is Navajo hand crafted out of genuine sterling silver, along with real Aventurine and White Agate beads. 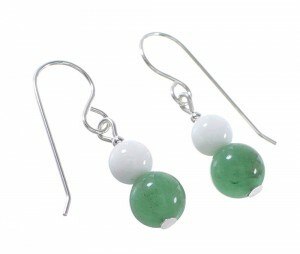 The earrings consist of: 2-mm silver round bead, 6-mm White Agate round beads, and 8-mm Aventurine round beads. 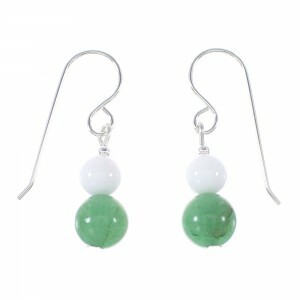 Aventurine is a quartz stone, it stimulates creativity and communications and balances the body. Agate is known to be a powerful healer as well as increasing strength and fortitude.